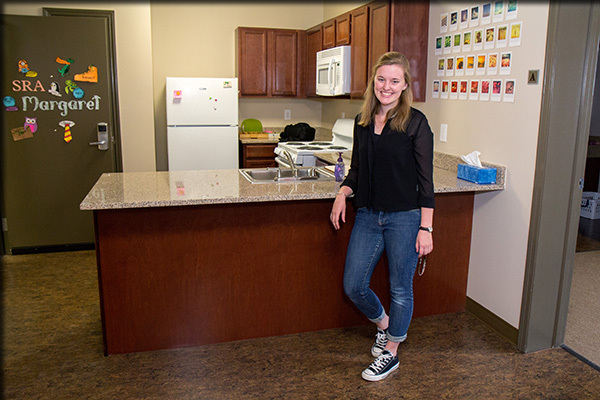 Senior resident advisor Margaret Foley lives in one of the new apartments in the Centennial Hall expansion. ESF's Centennial Hall opens for the 2014-15 academic year with an addition that has expanded its capacity by 84 students, increased space for group study and socializing, and roughly doubled the amount of space available for bike storage. The $7.3 million addition offers a mix of apartments and suites that will provide living space for ESF upperclassmen. The apartments all include a full kitchen and living room in addition to four single bedrooms and a bathroom; the suites contain two bedrooms, a bathroom, a full kitchen and a dining area. In addition, there are three one-bedroom apartments for senior resident advisers. The rooms are furnished with the same model of Stickley furniture that was designed for the original part of the building. The addition also provides space for new group study rooms where students can work on projects together, a large kitchen and dining that can be used by groups of students or visiting families to prepare meals, and additional laundry facilities. Students now have the use of a new vending operation offering fresh food provided by the Morrisille Auxiliary Corp., which operates the Trailhead Cafe in ESF's Gateway Center. Also, Centennial Hall's bicycle storage capacity has just about doubled, to some 180 bikes, and wireless access points have been increased. "Before we designed the space, we were able to get a lot of feedback from the students who have lived in the residence hall," said Brenda Greenfield, executive director of the ESF College Foundation, Inc., which owns Centennial Hall. "So students have had a lot of input into what this space would be like and how it can best suit their needs." Centennial Hall, the first residence hall operated by ESF, opened in 2011, the year the college celebrated its 100th anniversary. The residence hall recently earned a spot on the Princeton Review's "Best College Dorms" list. The building is LEED (Leadership in Energy and Environmental Design) Gold Certified and features an array of environmentally friendly construction elements. Orientation for first-year ESF students begins Tuesday, Aug. 19.